What words can really describe the pain inflicted upon a herd of beautiful and well-bred horses owned by a Brit living in Andalucia, Spain? Out of Sue Jenkins’ initial 50 horses, around 16 have already starved to death on scrub land and the remainder are alive but have only limited food and water supplies. Sue Jenkins denies all allegations of neglect and claims they died through drinking salinated water or eating hay containing thorns. 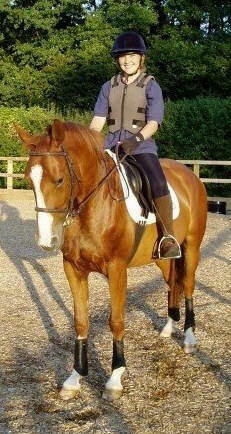 However, this is not a woman ignorant to an equine’s needs as she is herself an equine nutritionist. Like France, Spain has a slow and lengthy legal system and so it is impossible to get the horses moved to safety. Under Spanish law if the horses are seized then they have to be humanely destroyed, something that the WHW and RSPCA are trying to intervene to avoid. Several of the horses came from the well-known UK stud, Holme Trakehners, who are obviously very distraught at what has happened. They are trying to raise funds for Spanish welfare group CACMA so that they can at least feed the remaining horses for the present time. All details of how to donate are on the Holme Trakehners site. We at ERF have been in contact with Spanish welfare groups and Holme Trakehners to offer any assistance we can give to these horses. 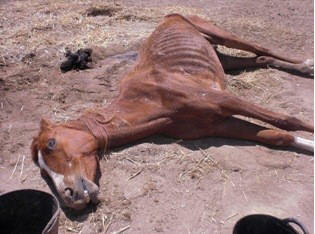 We have also contacted some leading equestrian figureheads to ask them to add their voices to resolve this travesty. Time is of the essence as most of these horses are in a critical state. We were asking the same questions ourselves but we also have similar cases here in France whereby horses have to actually die from neglect to get noticed.Sue Jenkins is mentioned on your site last year by several people posting comments though .